Former detective Nick Charles wants no part of the investigation of a missing inventor – he’d rather spend his Christmas vacation in a pleasant alcoholic daze. But wife Nora insists, and the tipsy-but-tenacious Charleses are on the case. 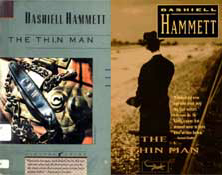 At first glance, Hammett’s fifth and final novel seems to have a lighter tone than The Maltese Falcon or The Glass Key. 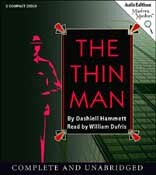 Closer examination, however, reveals that The Thin Man is Hammett’s most cynical novel: Nick Charles honestly doesn’t care is the killer is brought to justice or not. The Thin Man ushered in the now-familiar genre of the wisecracking husband-and-wife detective team. Written in two weeks simply because he needed the money, Hammett based the Nora character on his longtime lover Lillian Hellman (see below). The 1934 movie version starred William Powell and Myra Loy and spawned a rash of sequels. The Thin Man also became a popular radio series, and was on television for a time as well. Pop quiz: What does The Thin Man have in common with Frankenstein? Answer: Confusion over to whom the title refers. “Frankenstein” was the mad scientist, not the monster; the “thin man” was the missing inventor, not Nick Charles. In both cases, movie sequels only compounded the confusion. Lillian Hellman and Dashiell Hammett met in 1930 at a party. Hammett was coming off of a five-day drunk, yet Hellman was immediately taken with him. Although they were both married at the time (and Hammett never legally divorced), the two began a 31-year, on-again-off-again, relationship that would last until Hammett’s death in 1961. 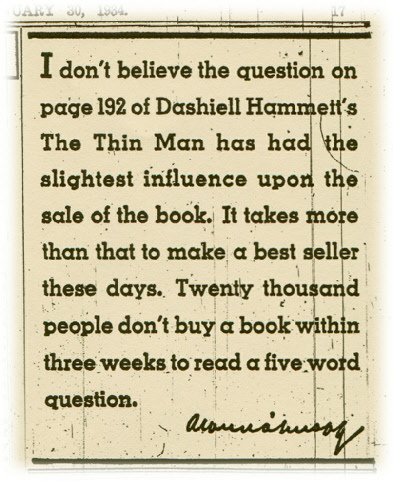 During this time, Hammett abandoned his writing career, while Hellman built a reputation as a playwright. Following his death, Hellman came to regard Hammett’s legacy as her personal property. Feeling that her “memories” (both fact-based and otherwise) should be the only record of Dashiell Hammett’s life, she vigorously obstructed the writing of any Hammett biography over which she couldn't dictate editorial control. In addition, through some legal maneuvering, she gained control of all of Hammett’s copyrights, which she held until her death in 1984. Through additional legal wrangling, the rights eventually returned to Hammett’s heirs. THE NOTORIOUS "FIVE WORD QUESTION"
NORA: Tell me something, Nick. Tell me the truth: when you were wrestling with Mimi, didn’t you have an erection? NORA: (laughing) If you aren’t a disgusting old lecher. His pulp days behind him, Hammett's Thin Man first appeared (in condensed form) in Redbook magazine, December 1933 issue. The Thin Man again appeared in magazine form in (of all places) the February, 15, 1936 issue of Australian Women's Weekly. 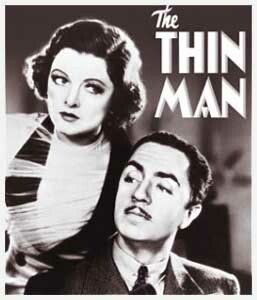 Hammett was asked to write the film treatment for the first Thin Man sequel. It remained unpublished until 1986, when it was serialized in issues 5 and 6 of The New Black Mask. "After the Thin Man" also appeared (in one chunk this time) in the UK publication Crime Wave. In 2012, Return of The Thin Man was published. 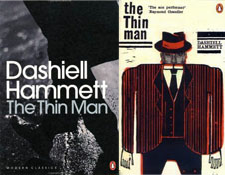 It included Hammett’s treatments of both After The Thin Man and Another Thin Man. The Adventures of The Thin Man was a network radio program (off and on) from 1941 to 1950. Claudia Morgan starred as Nora, while a series of actors (including Les Damon, David Gothard, Les Tremayne and Joseph Curtain) played Nick. The show never quite managed to match the quality of The Adventures of Sam Spade.